House Speaker Nancy Pelosi (D-Calif.) is fond of quoting a particular passage of Scripture. The quote, however, does not appear in the Bible and is "fictional," according to biblical scholars. In her April 22 Earth Day news release, Pelosi said, "The Bible tells us in the Old Testament, 'To minister to the needs of God's creation is an act of worship. To ignore those needs is to dishonor the God who made us.' On this Earth Day, and every day, let us pledge to our children, and our children's children, that they will have clean air to breathe, clean water to drink, and the opportunity to experience the wonders of nature." Cybercast News Service repeatedly queried the speaker's office for two days to determine where the alleged Bible quote is found. Thus far, no one has responded. Distinguished biblical scholars, however, cast doubt on the existence of the passage. John J. Collins, the Holmes professor of Old Testament criticism and interpretation at Yale Divinity School, said he is totally unfamiliar with Pelosi's quotation. "(It's) not one that I recognize," Collins told Cybercast News Service. "I assume that she means this is a paraphrase. But it wouldn't be a close paraphrase to anything I know of." Claude Mariottini, a professor of Old Testament at Northern Baptist Theological Seminary, told Cybercast News Service the passage not only doesn't exist - it's "fictional." "It is not in the Bible," Mariottini said. "There is nothing that even approximates that." "The quote does not exist in the Old Testament, neither in the New Testament," said the Rev. Andreas Hock, a doctor of Scripture who teaches in the Roman Catholic archdiocese of Denver's St. John Vianney Seminary. "Even in pieces or bits, (it) cannot be found in the Old Testament," he added. Interestingly, Pelosi has mentioned the quote before, Mariottini noted. "In truth, (she) has used this 'passage' in many different ways, and all of those usages have nothing to do with the Bible whatsoever," he said. Bwa! Bwa ha ha ha! Could it be that Nanny is getting a little senile? She's not much younger than John McCain, and we all know how hold he is. Maybe the botox injections are taking their toll on Nanny's brain and she can no longer distinguish between reality and fairytale? Wait - that's every Democrat. I wanted to give Pelosi the benefit of doubt, so I actually called her office and spoke with her about this above controversy and gave her a chance to explain herself. She said, and I quote, "Like the Bible says, 'no matter where you go, there you are.'" 1. Thou shalt always speak ill of a Republican. 2. Thou shalt always bear false witness against an opponent in a primary; and make it up by offering them a VP slot. 3. Screw others, before they screw you! 4. Thou shalt covet a sycophantic media. 5. Thou shalt have no other candidates before me! 6. Thou shalt not take my campaign promises literally! 7. Thou shalt sup at the trough of taxpayer funded junkets. 8. Thou shalt eat from the tree of plausible deniability. 9. Thou shalt blame thy opponents and the voters for your failure to nominate you by April! 10. Thou shalt turn thy opponent into a pillar of salt! Noah, "no matter where you go, there you are." Right!?!? 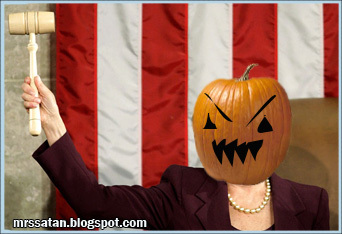 Yeah, Pelosi is off her rocker. Thanks for visiting and commenting Arc. Ditto that to Miller also. "And the Lord sayeth, "All hail Arc for he is My favorite man!'" Look I can do it too!! !